Writing the annual round robin to send out with her Christmas cards, Ellen realises it's all about the rest of her family. Exhausted by another year of single-handedly trying to create the perfect Christmas, Ellen escapes to a beach hut on the North Devon coast. The other beach hut inhabitants are trying to escape Christmas too. 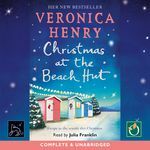 But the spirit of the season wheedles its way into everyone's hearts and soon there are fairy lights round the beach huts and a turkey on the barbecue! So when Ellen's family track her down, how will they convince her she means the world to them - every day of the year?